As a premier endpoint protection solution, Vision keeps companies secure from hackers. With our reseller program, IT firms and other organizations have the ability to distribute and deploy Vision quickly to their clients. Our Managed Detection and Response SaaS provides you with leading-edge tools and techniques. As an Authorized Partner, you’ll receive premium support to ensure customer security success while achieving increased profit margin. We’re ready to help you secure your clients. Get a demo and talk to industry experts to learn what partnering with us can do for you. 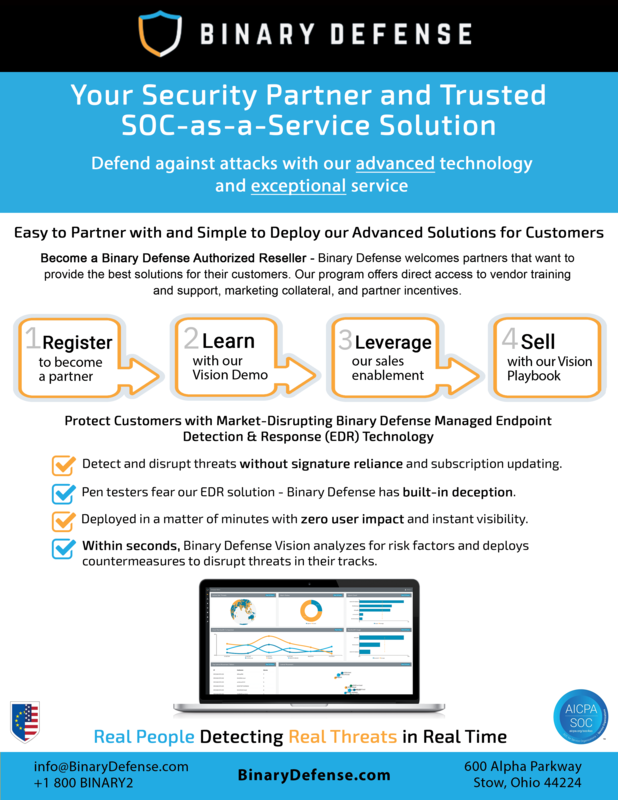 Binary Defense is a cyber security business that provides peace of mind regarding today’s most pressing cyber security issues. We provide you with high-tech, high-touch, high-confidence security protection.